Jettje was born in Havelte, on the 30th of October 1882, as one of the seven children of Jacob Rozendal and Schoontje Glazer. In 1915 she married (non-Jewish) Jan Veneman, who came from Zwollerkerspel. Jan had been married before, to Maria Hendrika van der Kolk. 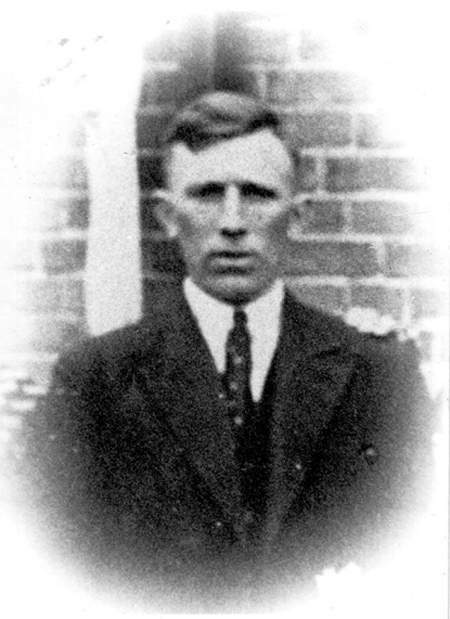 On 1 April 1913 his wife died and two years later he married Jettje Rozendal on 7 November 1915.That date was also the date of birth of his eldest son Jan Veneman. The couple had four sons: Jan, Jacob, Johannes and another Jan. However, Jan Veneman left Jettje. From a relationship before she married Jan, Jettje had another two sons: Mannes and Bart. Mannes remained in Meppel and Bart moved elsewhere. Mannes was married to a Christian lady, Egbertje Spin. The couple lived at 15 Noteboomstraat. They had three children: Jacob, Jantje and Talligje. Mannes worked as a labourer, but was not a physically strong man. During the Second World War Mannes died at the age of 38. Then in January 1941 within the framework of Regulation 6/1941 all Jews were to be registered, including Jettje. At the time she was registered it said she was married to Jan Veneman. If that had been the case, things would have ended differently with her. During 1942, when the web continually got tighter around the Meppel Jews, it became obvious that soon all the Meppel Jews would have to leave. Including Jettje? 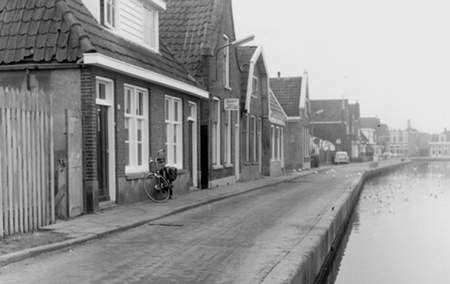 If she had still been married to Jan Veneman, she would have been allowed to remain in Meppel. If she could not provide any proof of her marriage then like all the other Jews she would be deported. Seeing that she was ‘confused’ or to put it mildly ‘not one of the brightest’ she was not capable of giving the necessary data to fill in the Declaration for the Assessment of a Mixed Marriage (which was rather complicated as usual). All kinds of attempts were made to find her ex-husband and their three sons Jacob, Jan and the other Jan, who no longer lived in Meppel. Letters asking for information were sent in order to make the Declaration complete, at the utmost before the closing date mentioned in the forms, the 25th of September. In relation to the correct filling in of the ‘declaration for the assessment of a mixed marriage’ in the name of the spouse [in the letters to the sons: ‘mother’ TR] of the person to be named (Jettje Rozendal) is requested a statement that Jan VENEMAN, born at Zwollerkerspel on the 28th of May1881, who was deleted from our register and entered in your register at 5 September 1917, is still living in your community and what his religion is. We would also like to know the letter and number of his identity card. If the person mentioned died in the meantime, then it is requested to state place and date of death. His spouse, [for the children ‘mother’ TR] Jettje Rozendal, named above, is unable to give the information requested. We would appreciate it very much if you could handle this matter as quickly as possible. Such letters show the enormous bureaucracy at that time. 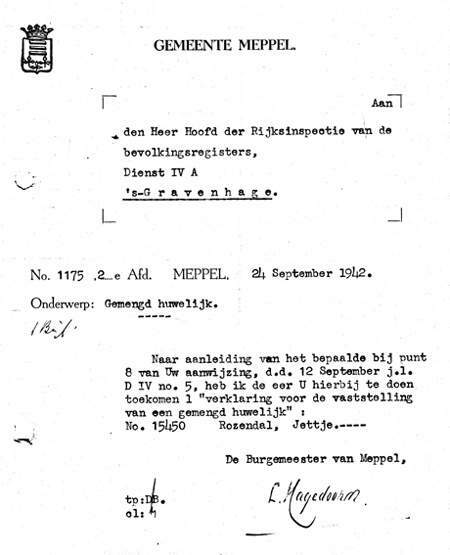 Of course everybody in Meppel knew exactly the ins and outs of the matter, but the Germans wanted the forms to be filled in correctly. In the next few days, there was a lot of correspondence between Meppel local council and the other councils of Zwolle, Deventer, Rotterdam, Den Haag (the Hague), Wierden and Apeldoorn to find out the civil status of her ex-husband and their children. It was just in the nick of time, but on the 24th of September the declaration for the assessment of a mixed marriage, so much needed by Jettje, was sent to the State Inspectorate of the Registry Office. Jetje Rozendal received the certificate of declaration of a mixed marriage from the mayor of Meppel on the 16th of September 1942. But … what went wrong? Was all the information not enough, did the letter arrive late? The fact is that Jettje Rozendal had to leave Meppel. There are two versions of the story of her departure. One version is that she was taken from her house on Galmanspad by force by the ‘overactive’ Dutch police officer Slots. Another version is that she was taken out of the Albino shop on the corner of the Hoofdstraat (High Street) and Zuideindigerpad, where she was shopping at that moment. She refused to go with them and this deportation was debatable even according to German standards, for she had been married to a non-Jewish man! It was not meant to be; she left Meppel by DABO bus, together with her shopping bag with food and a cushion. She was put on transport to Westerbork. She herself thought she was going to stay somewhere. On the 9th of October 1942 she was transported to Auschwitz and died there on the 12th of October 1942. Both her sons Bart and Jan were still in Netherlands. They got terribly afraid and went into hiding. Jettje Rozendal lived in a small house on Galmanspad.